Congratulations to the CFE team who completed the Ring of Kerry annual cycle on 7 July 2018. 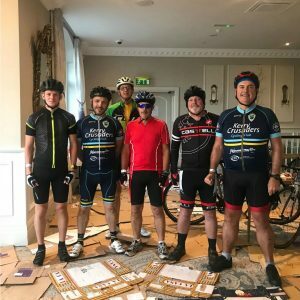 The 180 km cycle ride raises circa €1million annually for Kerry charities and whilst it is a leisure cycle the CFE team add a competitive element. They award a prize for first person home, this means cycling for up to 6 hours with only brief stops for water, it doubles the effort but adds to the fun. Well done to Curtis Ashcroft from CFE Haydock who was first home followed on his heels by Con Lynch from CFE Castleisland Team. View information on the Ring of Kerry annual cycle. Pictured left to right: Curtis Ashcroft, Eddie Barrett, Phil Carter, Euros Davies, Chis Byron & Con Lynch. 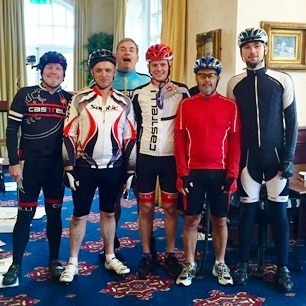 On a wet and windy Saturday morning in July, the CFE team of cyclists once again participated in the Ring of Kerry charity cycle ride. The Ring of Kerry has become one of the most successful cycles on the European cycling calendar, this year attracting 11,000 cyclists.